In my previous blog post, I discussed a scientific process known as the Polymerase Chain Reaction. 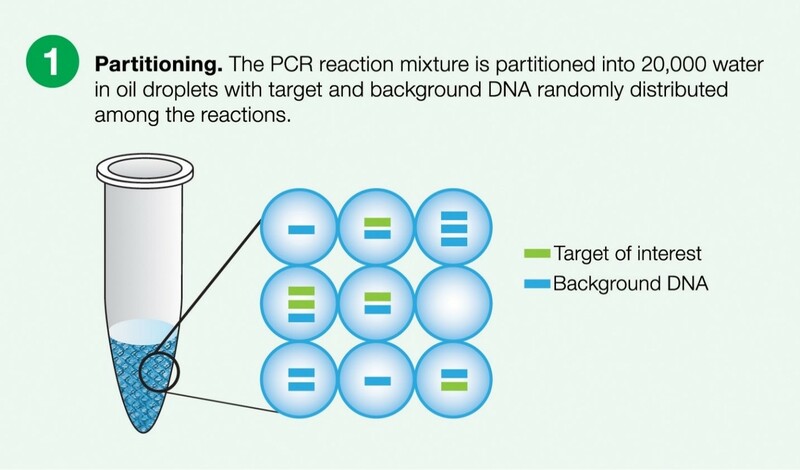 Using the simple steps in this procedure, one can take a small amount of DNA and reproduce it exponentially until they obtain an ample, usable sample. 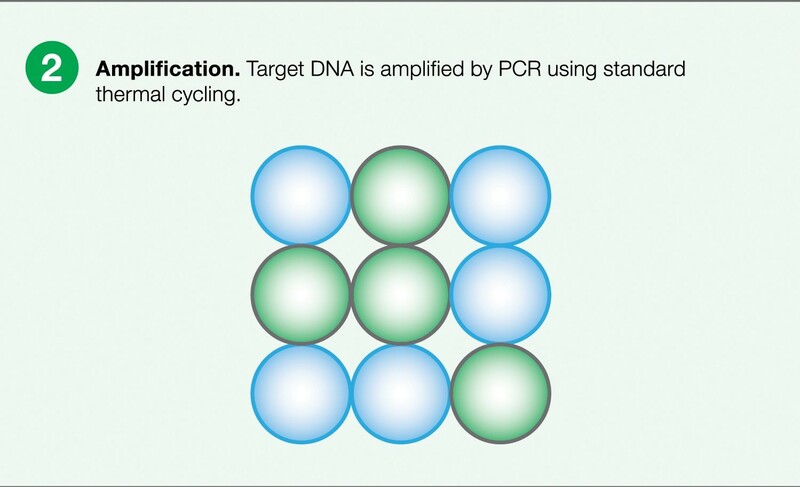 Using PCR, other more detailed techniques have been developed to give a more quantitative measure regarding the amount of DNA or RNA that is seen in a particular sample. One example of this is real-time PCR, which has been used in a number of important experiments throughout the years. However, today we will be discussing a newer procedure known as droplet digital PCR (ddPCR). Digital PCR is generally considered to have a higher precision rate than real-time PCR. Before we delve into the actual methodology behind droplet digital PCR, we should first discuss why it is important to quantify DNA and/or RNA. One situation in which ddPCR comes in handy is when one is trying to look at CNVs, or copy number variants, in a particular sample. For example, the number of amylase genes in humans can vary depending on the individual. If you want to tell how many copies of the amylase gene a particular individual has, then you can use ddPCR to get the answer. Furthermore, active genes use RNA as their messenger molecule to create particular proteins, so measuring RNA levels using ddPCR can tell how active a particular gene is. To begin the process, the samples will need to be mixed with specific primers and probes (with fluorescent tags) that recognize the sequence that you are attempting to get the copy number of, as well as a sequence of known copy number (or in the example of RNA – a region of questionable activity versus one with a stable activity level such as a housekeeping gene). The first step of this procedure is partitioning. This simply means dividing up the sample into equal volume droplets. As the image shows, the target and background DNA will be randomly distributed throughout the droplets. This is done in an automated fashion. The samples are then amplified through normal PCR in each droplet simultaneously, maintaining ratios of the targeted DNA segments. 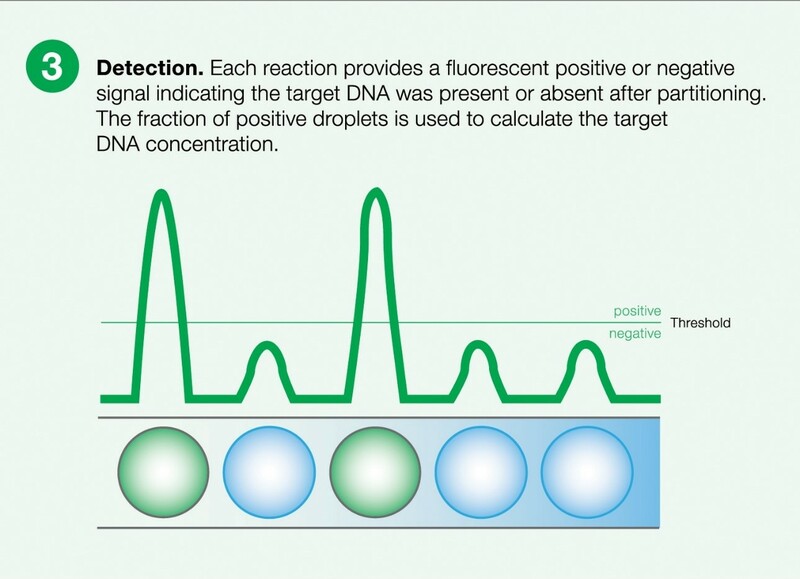 The ddPCR machine then detects the levels of fluorescence of both target regions. Using this, you will receive ratios that can then be used to determine quantities based off of your “known” segments. In other words, we compare the amount of fluorescence given off by the segment of known value to those of the unknown value. We will use the example of salivary amylase to further illuminate how this process works. Let’s say that we are comparing a gene that we know has two copies in every healthy human against the salivary amylase gene. If the machine reads off a ratio of one to four respectively, then we know that the individual in question has eight copies of the salivary amylase gene. The simple math can be seen below. Droplet digital PCR is largely automated which cuts down on the amount of human error, making it very precise. This process is also more accurate than real-time PCR because of the way in which the machine reads the fluorescence. It does so through the previously mentioned partitioned droplets. Because the droplets are so small, the ideal situation would be for them to either have one fragment of target DNA, or none. This means that the droplets can, and will be measured as a “have” or a “have not.” This allows for easy and accurate measurements of the fluorescence. And that’s all there is to it! Until next time, carry on with curiosity!